Choreographer Gideon Obarzanek took the concept for Wanted from Russian artists Komar and Melamid, who in 1993 polled Americans on the most statistically desirable painting (see the interview with Obarzanek). 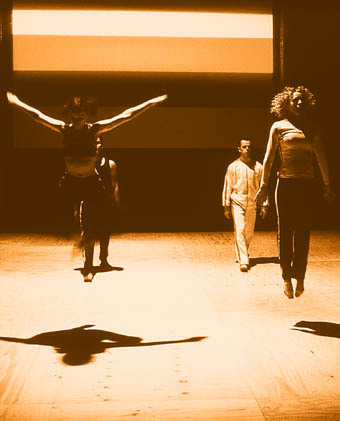 A comparable survey on the elements of a dance production was carried out for Wanted. However the most and least desirable dances only feature during the opening and finale; most of the piece being what Obarzanek calls a “dance documentary.” That is, a seated woman reads findings, examples of which are then presented. This self-reflexive, show-and-tell format is novel and engaging, a kind of postmodern Brechtian approach, with tongue firmly in cheek. Dance is fragmented down to its most basic elements to the point of absurdity, as spectators are offered a rough guide to dance terminology (erratic versus soft movement, etc). Obarzanek’s own muscular choreography does, however, inflect many of these examples. The survey is a great springboard for devising material, but the comparative findings between the various polled groups, which give Wanted its humour, are devoid of statistical validity. Over 75% of the respondents were female teachers and dancers aged 15-45, mostly from Victoria and NSW. It is therefore unsurprising that other populations appear to exhibit unusual tastes—“Northern Territory people have a higher preference for techno/dance music.” These groups constitute such relatively small samples that a few strange responses amongst them displaces the mean. The comic approach also eventually wears thin. Obarzanek’s own choreographic style consists of an aggressive form of dance theatre, exhibiting a high degree of dramatic expressiveness. Yet when “expressive movement” appears as one of the most wanted qualities, it is not Obarzanek’s own style which is displayed, but rather an inflated spoof of bad Graham technique, arms thrust to the sky as the dancers sigh loudly. Obarzanek thereby excludes himself from the critique of popularism he is offering. The audience is therefore finally cheated, as the “most wanted” work itself is not performed at all, but rather a deliberately silly send up of it. Nowhere on the survey were respondents asked if they wanted their opinions mocked. Instead, one is left feeling that Obarzanek is talking down to his audience. ‘Here is the dance which you asked for’, he seems to be saying in a superior way, ‘and isn’t it crap!’ A valuable opportunity has therefore been lost. If the dancers actually meant it when they performed the most wanted piece, one might be better placed to discern what makes such choreography so statistically compelling. It is ironic therefore, that Obarzanek—a frequent champion of pop culture in dance—has employed a mass marketing model to generate a work that ends up conforming to the stereotype of elitist arts: showing up the masses for their poor taste. It is the simplistic bread’n’circuses critique of mid-century Marxism all over again. The “least wanted” work, by contrast, provides a more satisfying spectacle, albeit also a comic one. The most wanted style is akin to Graeme Murphy’s Sydney Dance Company—no surprises there (though in an apposite program note Tom Wright compares the polled preference for soft yet athletic dance dealing with the human condition to the Nazi Triumph of Will). The least wanted aesthetic however, appears to be angular dance theatre performed to discordant music. Obarzanek offers us, therefore, an extremely funny Cubist take on The Three Little Pigs. A choice that—in a more generous vein than the show overall—implicitly sends up Obarzanek’s own dance history, as his 1999 piece All the Better to Eat You With explored another fairytale. The bemusedly deadpan delivery of this section is also far more respectful of its audience. The program closes with Clear Pale Skin, an equally promising work which does not quite fulfil expectations. This features another of Obarzanek’s psychotic female characters, here superbly played by Fiona Cameron as a dancer obsessed with the measurements, aesthetics and form of a fellow dancer (Nicole Johnston looking suitably gorgeous). The narrative of obsessive narcissism leading to murderous intent is well handled, but the only surprise in this familiar tale (Single White Female etc) is how beautiful it all looks. Slight reference is made in the work itself to the outside forces which have made this character feel this way. The drive for perfection is therefore rendered primarily as the personal problem of this woman rather than a social one with which dance itself is complicit. Cameron’s own works (Looking For a Life Cure, Buy This) are more eloquent in this regard. Overall, both Wanted and Clear Pale Skin are fine pieces, which nevertheless rarely move beyond pedestrian social observations, leaving aside more nuanced understandings of the relationship between the individual and culture. The strength of these works therefore lies less in their conception than in their assured execution, with Chunky Move’s long-term dancers looking better every day.